Today was Chiquita's 3rd Birthday! In fact, right now it is only minutes away from when she was actually born. We had a wonderful day, but I am too tired to share it with you now... I'm off to bed--even though this is early for me!! Hopefully I will have a chance tomorrow to post a few highlights. Before I go though, I wanted to let you all know that Chiquita LOVED her cake! Happy Birthday my Sweet Chiquita!!! We love you so very much! That cake almost looks too good to eat! Happy Birthday you little cutie!! Your Mommy did a great job on that cake, huh! Happy Birthday you beautiful little girl!!! She is triple cute!!! Freeze her right now before she grows up! I love all your party plans and cakes! 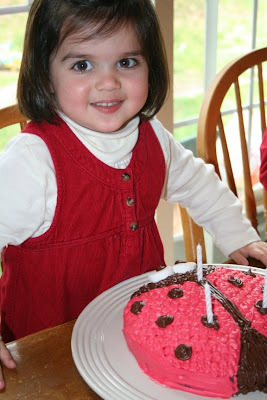 I made a ladybug cake too for my oldest when she turned 1 and that was 13 years ago! I love making birthday cakes for my little ones and my blog is a collection of the cakes I've made along with all things faith, family, and homeschool related! I also love St. Therese the Little Flower, my favorite saint! God bless and when you get a chance feel free to drop on by my cake page on my blog, "A Slice of Smith Life". My cake page link is here: http://asliceofsmithlife.blogspot.com/p/cakes.html God bless and thank you for all you do to share our beautiful Catholic faith with your beautiful family and so many others!